Today, by great good luck, I saw something remarkable. The local astronomy club set up telescopes for viewing the transit of Mercury across the sun. After a solid week of raw, rainy weather, we had a brilliant day. There was a strong wind – the guys told me the wind had actually played havoc with the telescopes – and scarcely a cloud in the sky. I got to the field about a half hour before the viewing period ended and got to look at or through three of the scopes. The first one showed the silhouette of what was happening; a rather blurry image cast on what looked like grey vinyl or canvas. The second gave a very good view, with the sun looking very orange. What I took for Mercury was actually a sunspot; the sunspots are a good deal bigger than the planet! But then I came to the third scope. This blocks out all light but Hydrogen 2, I think the guys told me. Through it, the sun looked very sharp and clear, and a very dark orangey red, like a blood orange. Like a blood orange, it had crinkly skin – or seemed to. 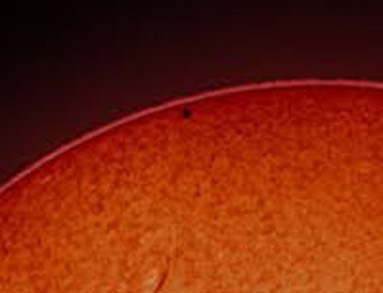 Mercury was also very sharp and clear; a perfect little black circle towards the bottom of the sun. And – in this scope, I could see two solar flares! They looked almost like permanent features, like waterfalls, and they were huge! Bigger than Mercury. One of the guys said a single solar flare can be as long as five times the diameter of the earth. I couldn’t believe I could actually see them. The guys told me the transit happens every nine years, so maybe I’ll get to see this again. And maybe next time I’ll have some friends or family with me. But I can’t imagine a more perfect viewing. *There were swallows dipping and soaring overhead, and clover, and bees, and lots of birdsong as well as the transit. A perfectly lovely afternoon!